Tel Aviv, Bograshov: A Tel Aviv woman had her very own “Start-Up Nation” moment today, and the whole city is talking about it. 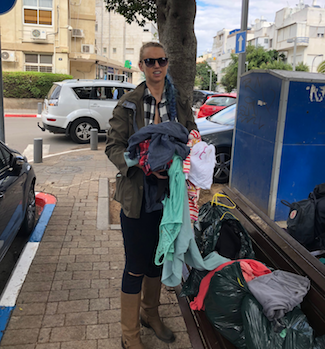 Ukrainian Olah Natasha G. was throwing away old clothes when she accidentally opened one of Tel Aviv’s trendy “pop-up stores”, which are stores that, like, pop up in Tel Aviv from time to time. Natasha explains. As we were speaking to Natasha, Alert local Ronit S. interjected to ask what time the store closed because she was on her way to a job interview with a Start-Up near Neve Tzedek, but wanted to stop by when she was finished. She was wearing tan linen business slacks, a cropped vest, and a sports bra. Dear Daily Freier: Question Time!